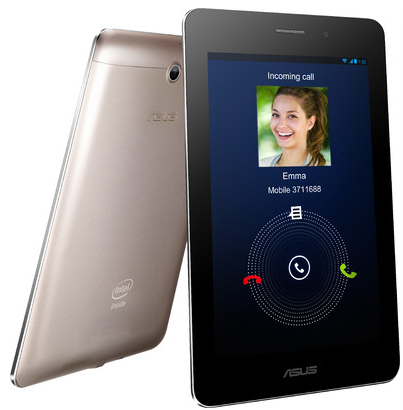 ASUS launched its calling tablet Fonepad earlier this year, an upgraded version of this tablet with Better processor and 32 GB RAM is now available in India for Rs. 17,999. Few days back Samsung Launched Galaxy Tab 3 7.0 and Galaxy Tab 3 8.0. This 7 inch tablet with a faster processor and more internal storage is quite moderately priced at 17,999 and is expected to give good competition to its rivals. The upgraded version of this tablet comes with 1.6 GHz Intel Z2460Atom Processor with PowerVR SGX540 GPU. The earlier version was equipped with a 1.2 GHz Z2420 processor. Many users complained about the lag on this Tab while running gamming applications. The RAM capacity remains same at 1GB and ROM capacity has been increased to 32 GB. This Tab runs on Android 4.1 jelly bean O.S. The display is a 1280 x 800 pixel IPS LCD touch screen. Pixel density is 216 ppi which is more than that of Galaxy Tab 3 (170ppi). This is good clarity display although the screen is quite reflective. Asus hasn’t addressed this problem with this new upgraded version. Primary camera is 3.15 MP Autofocus camera with 2048 x1536 pixels and a secondary camera of 1.5 MP is also present for video calling. Clearly these devices are not meant for extensive photography. The battery capacity is 4270 mAh which will give you a talk time of 9 hrs, though most probably you won’t be using it as your primary calling device owing to its large size. Battery capacity is above average at this price range. This tab weighs 340 grams which is slightly heavier as compared to others. Connectivity features include GPRS, EDGE, HSDPA 21 Mbps, WiFi, WiFi hotspots, Bluetooth 3.0 and USB. This Tab provides you with Good Value for money. ASUS headed to the complaints of consumers and has tried to eliminate its weaknesses. this device is now a worthy competitor of Samsung Galaxy Tab 3 7.0. ASUS Fonepad is available on Flipkart at a price of 17,999.